Arnold Chiari Malformation, also known as Chiari type II malformation, is one of a group of brain malformations affecting the cerebellum. Named after Hans Chiari and Julius Arnold, the pathologists who first described the group of malformations. This condition is almost always associated with myelomeningocele, the most serious form of spina bifida. Normally the cerebellum and parts of the brain stem sit in an indented space at the lower rear of the skull, above the foramen magnum (a funnel-like opening to the spinal canal). When part of the cerebellum is located below the foramen magnum, it is called a Chiari malformation. In Arnold Chiari Malformation, both cerebellar and brain stem tissue protrude into the foramen magnum and the cerebellar vermis (the nerve tissue that connects the two halves of the cerebellum) may be only partially complete or absent. This condition has skull, dural, brain, spinal, and spinal cord manifestations, including downward displacement of the medulla, fourth ventricle, and cerebellum into the cervical spinal canal, as well as elongation of the pons and fourth ventricle, probably due to a relatively small posterior fossa. Many people with Arnold Chiari malformation have no obvious symptoms. Compressive mechanisms are thought to cause symptoms, but it is likely that stretching of abnormally placed cranial nerves may provoke symptoms. In babies, the most common symptoms are a weak or absent cry, breathing difficulties, including stridor, arching of the neck, failure to thrive and feeding or swallowing difficulties. Blockage of cerebrospinal fluid (CSF) flow may cause formation of a syrinx, which can lead to syringomyelia. Central cord symptoms such as hand weakness, sensory loss, and, in severe cases, paralysis may occur. The key tests for diagnosis of Arnold Chiari Malformation are MRI and CT scans. An MRI will show the abnormal CSF flow and configuration and position of the brain and spinal cord. Antenatal ultrasound imaging shows an indentation of the frontal bone with an abnormally shaped cerebellum. The main differential diagnosis is the type of Chiari malformation. Chiari I malformation does not have a myelomeningocoele. Chiari III has an occipital and/or high cervical encephalocoele. 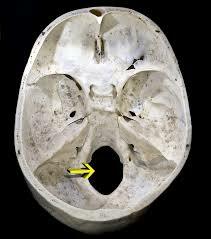 Chiari IV has severe cerebellar hypoplasia without displacement of the cerebellum through the foramen magnum. It used to be said that Chiari malformations are rare, but with routine use of MR imaging Chiari malformation is discovered with increasing frequency. Chiari II is found in all children with myelomeningocele, although less than one-third develop symptoms referable to this malformation. craniovertebral decompression may be required in neonates with brainstem dysfunction if hydrocephalus is not present, or if symptoms and signs do not improve with shunting. Some older patients with hind brain herniation or syringohydromyelia may also benefit from ventricular shunts. See resources on the Chiari Malformations page for links to useful items by the Brain & Spine Foundation. ↑ Truivit CL, Backovich A. Disorders of brain development. In: Atlas SW, ed. Magnetic Resonance Imaging of the Brain and Spine. 2nd ed. Philadelphia, Pa: Lippincott-Raven; 1996. ↑ Stevenson KL. Chiari Type II malformation: past, present, and future. Neurosurg Focus. Feb 15 2004;16(2):E5. ↑ Dias M. Myelomeningocoele. In: Choux M, Di Rocco C, Hockley A, Walker M. Pediatric Neurosurgery. London: Churchill Livingston; 1999:33-61.